You*ll find the DoubleTree by Hilton Downtown Madison hotel in the center of all of the action. 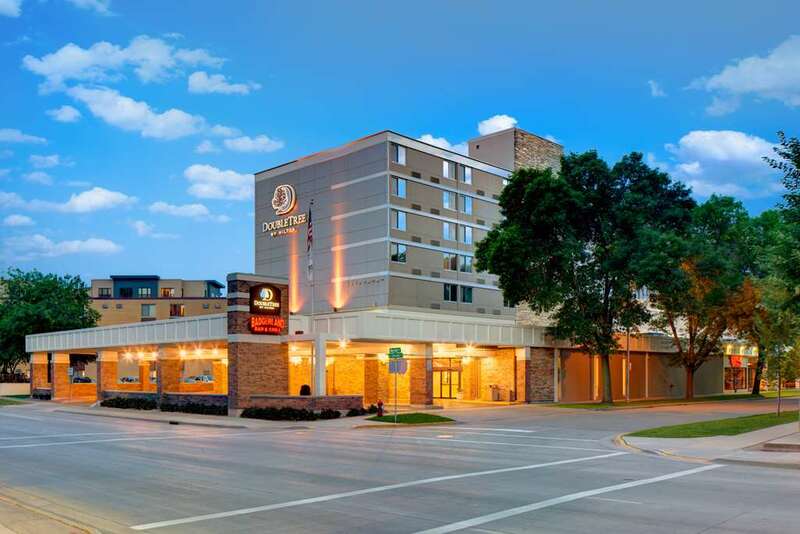 Just steps from the Kohl Center and the University of Wisconsin-Madison campus our hotel is in walking distance of the Capitol State Street and many other downtown Madison attractions. Enjoy complimentary parking and shuttle service to/from the airport and surrounding area complimentary WiFi and renovated guest rooms. Our award-winning staff looks forward to welcoming you to our hotel and the famous and unique city of Madison. Room Service: Room Service is available daily from 6 AM - 11 PM. Badgerland Bar - Grill: Enjoy breakfast lunch and dinner in a casual University of Wisconsin themed restaurant. Breakfast is served from 6 AM 11 AM . Breakfast Buffet is served Monday through Friday from 6 AM 10 AM. Weekends from 7 AM 11 AM. Lunch is served from 11 AM 130 PM. Dinner is served from 5 PM 10 PM. On-Site Catering: Ask about our on-site Catering services for your next meeting event or reception. Call our Sales and Catering Department today to make arrangements.